Monitoring a patient’s vital signs - such as temperature and heart rate - could soon be a simple as sticking on a tiny, wireless patch similar to a temporary tattoo. Eliminating the bulky wiring and electrodes used in current monitors would make the devices more comfortable for patients, according to an international team of researchers who report their findings in today’s edition of the journal Science. The researchers embedded electronic sensors in a film thinner than the diameter of a human hair, which was placed on a polyester backing like those used for the temporary tattoos popular with children. The result was a sensor that was flexible enough to move with the skin and would adhere without adhesives. The researchers said the test devices had remained in place for up to 24 hours. Although normal shedding of skin cells would eventually cause the monitors to come off, the team believe the new device could remain in place for as long as two weeks. 'What we are trying to do here is to really reshape and redefine electronics to look a lot more like the human body, in this case the surface layers of the skin,' said John A. Rogers of the University of Illinois. In addition to monitoring patients in hospitals, other uses for the devices could include monitoring brain waves, muscle movement, sensing the larynx for speech, emitting heat to help heal wounds and perhaps even being made touch sensitive and placed on artificial limbs. The device will help fill the need for equipment that is more convenient and less stressful for patients, permitting easier and more reliable monitoring, said Zhenqiang Ma, an engineering professor at the University of Wisconsin, who was not part of the research team. 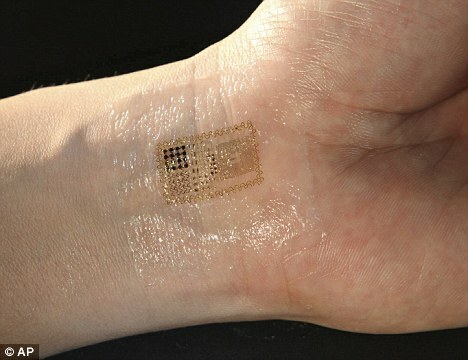 The electronic skin can simply be stuck on or peeled off like an adhesive bandage, he noted in a commentary on the report. The team declined to speculate on how soon the electronic skin would be ready for market or what it would cost. The monitor resembles a bandage and contains an antenna that could be used to transmit data, though a radio to do that transmitting has not yet been tested. The current design has a small coil and could be powered by induction - by placing it near an electrical coil. This would permit intermittent use, and for longer-term monitoring a tiny battery or storage capacitor could be fitted. The monitor does not use an adhesive, relying on a weak force that causes molecules and surfaces to stick together without interfering with motion. 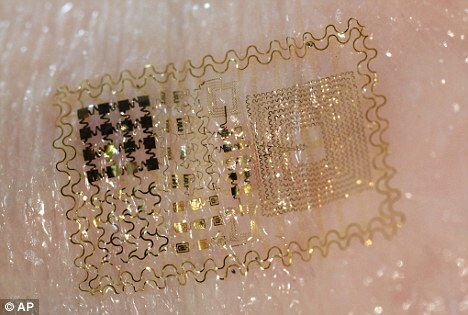 For longer-term use the electronic skin could be coated with an adhesive.